All page references are to The Fantasy Trip In the Labyrinth rulebook, unless noted otherwise. Wizards are born like anybody else in Dran. Most of the wizards in Dran are human, mostly because a majority of the civilized population is human. Four hundred candidates, i.e. 10% of all the 6-year olds in Dran, apply every year at the Dranning School of Wizardry. Forty of these are selected to be trained as wizards and half of these will fail or drop out (mostly in the first two years). And every year twenty 16-year old apprentices graduate after ten years of basic wizard education. An additional two wizards are produced elsewhere in the duchy each year through private or informal education of various kinds. A typical 16-year old graduate of the Dranning School of Wizardry will have 28 total attribute points (I.e. a human would be ST 6 DX 9 IQ 9 with four additional attribute points), her native tongue, Elyntian(which is usually her native tongue), Literacy(as her mundane talent), Aid, Staff and up to four other skill points in talents and spells. She will have a bag, two robes (wearing one), her staff and 2d-2 * 10 silvers in cash or other possessions. Over the next four years of her apprenticeship she will gain and expend 400 XP in raising two points of ST and two other attribute points to be allocated freely, learn up to her current IQ level in spells and talents, and save up to $1000 in cash and possessions. She will then be a 20-year old 32-attribute $1000 typical starting wizard with a full selection of spells. Children trained by the Wizard's Guild to be wizards usually take their one mundane talent point in Literacy, and this can be assumed when converting Wizard wizards to ITL. Unfortunately these academy trained wizards have very little "real world" experience outside the academy's walls and so roll one additional die for untalented uses of Woodsman survival, Recognize Value, Business Sense, Detect Traps, etc. If they learn Area Knowledge, Alertness, Detect Traps or whatever then they will negate this penalty in the areas covered by their talents. They do have connections in and knowledge of the Wizard's Guild and so roll one less die when working through their school connections to find magic items for sale, wizards who know specific spells, etc. 36 provide ST for a dozen enchanters at the Dranning Senior Chapter of The Wizard's Guild. 32 provide ST to operate the four gate stations of Dran. 8 work for various government agencies in Dranning. 4 work for other Guild sanctioned employers in Dran. Around the age of 20 these apprentices pass their Journeyman examinations and then work an average of thirty years each as full adult wizards. There are roughly 80 wizards and 20 non-wizard Alchemists in the Dranning Senior Chapter of The Wizard's Guild. The Senior Guildmaster also acts as the Duke's Mystic Advisor and as the Headmaster of the Dranning School of Wizardry. The majority of wizards in Dran are graduates of this school. Twenty of the guild members are teachers at this school, each with their own lab and twenty to forty students. Two hundred and fifty of these students are wizards in training between the ages of six and fifteen receiving basic knowledge of wizardry (200 of whom board at the guild with another 50 living with their parents in the city) while the remaining hundred students are sixty heroes (ages 15 and up) learning a few spells each and forty adult students of Alchemy. Tuition is $25/week which covers forty hours a week of instruction for the wizards in training (with a hidden $25 subsidy from guild dues) or twenty hours a week for non-wizards taking non-subsidized evening/weekend classes. Boarding student families are charged another $25/week for room and board. The Dranning chapter of the Wizard's Guild has another score labs dedicated to alchemy production. Most of the potions produced are consumed in training or magic item production on site. A half mile away from the wizard school and guild the Scholars have their own Senior Chapter and academy of roughly the same size. The two academies have academic (and potion) exchanges, guest lectures, and a long rivalry between their sports teams. Should you encounter in Dranning a wizard who knows mathematics or a scholar who knows alchemy then they have most likely spent some time in both academies. 8 Dranning Health, Fire and Rescue: Light, Detect Life, Summon Scout, Minor Medicament, Control Animal, Great Voice, Reveal/Conceal, Cleanse Poison, Friendship, Magic Rainstorm, Control Elemental, Fireproofing, Open Tunnel, Scrying, Dispel Illusions, Fresh Air, Remove Thrown Spell, Astral Projection, Regeneration, Cleansing, The Little Death, Revival, etc. There are two Gate Maintainers(age 4d+20, with DX 12+, Aid, Literacy, Create Gate, Staff, Ward), two Journeymen(age 2d+18) and eight Apprentices(age 1d+15) on duty for every 100 passengers per hour through the Gate Station. Use the Wizard map. 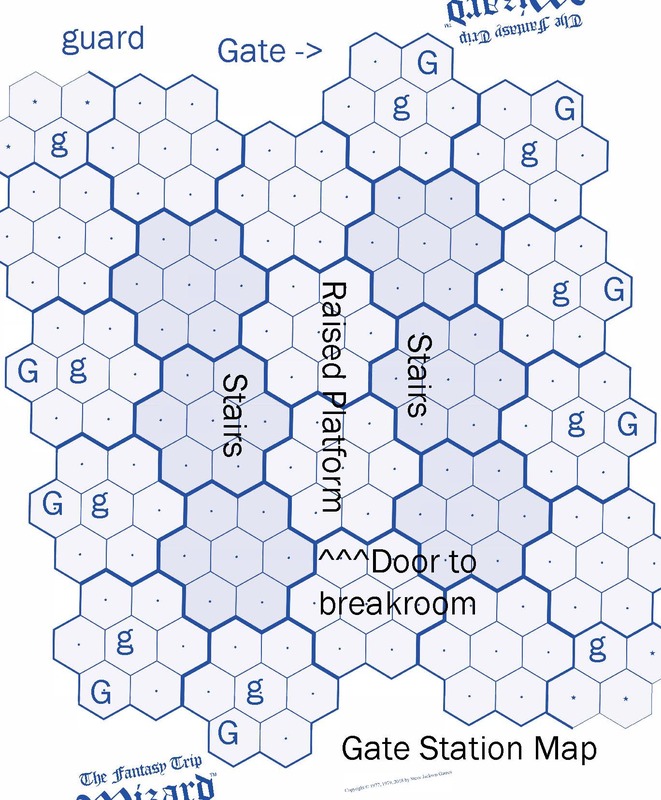 The wizards are sitting reading books on a platform raised two yards above the floor in the two center megahexes (with stairs down to the two megahexes that are adjacent to both platform megahexes). The south wall of the raised platform has a door with stairs down to a lower level with a supply closet, breakroom and bathroom. The marked entry hexes are the street entrances, with one guard per entrance. The eight edge megahexes that aren't adjacent to the entryways or the central platform each have an armed guard (who collects $1 per figure fare, coming or going) and a gate to a different location. In addition to the 22 personnel on duty there will be 2d-4 random passengers passing through the station at any given moment. Each Gate Maintainer casts Ward on each gate and entrance to this large room at the start of each shift. On the other side of each gate is another Gate Station or a guard post. In either case there will be another guard there who collects another $1 for a minimum trip cost of $2. The average shift-week (8 hours * 5 days) will operate at 50% capacity and so collect 50 * 8 * 5 = $2000 in fares while paying out $1400 in payroll. The four Gate Stations in Dran (Dranning, Tro, Bordre and Canigli) employ a total of 16 adult wizards, 2.4% of all active wizards in Dran. They also employ 32 child apprentices, 40% of the recent Dranning graduates. Dranning's eight gates go to the Elyntian capital, Tro, Bordre, Canigli, Kel, Bridgefort, Rubydelve, and one floating gate for seasonal harvest or other special occasions. Tro's eight gates go to Dranning, Canigli, Podliforku, Thargi Swamp fort, capital of Bolors, the fort at the junction of the King Ater and Bright rivers and two floating gates. Bordre's eight gates go to Dranning, Winterhome, the four dwarven settlements, and two floating gates. Canigli's eight gates go to: Dranning, Tro, four cities in Deseret and Bolors, and two floating gates. The Fantasy Trip(t.m.) is a trademark of Steve Jackson Games, and their rules and art are copyrighted by Steve Jackson Games. All rights are reserved by Steve Jackson Games. This game aid is the original creation of Henry J. Cobb and is released for free distribution, and not for resale, under the permissions granted in the Steve Jackson Games Online Policy.